Our most popular courses keep you and your team safe in the workplace, and keep your family safe at home. Comprehensive First Aid is a minimum requirement for most workplaces. All workplaces including industry, sports, education centres, and construction. Comprehensive First Aid is our most popular course designed to meet the requirements of workplace first aid for many industries and a prerequisite for further advanced training. Whatever industry you are working in, such as construction, tourism or education, a Comprehensive First Aid course will help you know what to do in an emergency or at the scene of an accident. Being able to respond first, while waiting for medical professionals to arrive, is essential to helping others and saving lives. It's a great course for first aid at home too, so you can look out for your family. This course meets NZQA standards and requirements of the “First Aid for Workplaces – A Good Practice Guide 2011” for the majority of workplaces. The course is recommended for all workplaces, including industry and factory workers. It's also recommended for sports teams that need to provide a higher duty of care to better manage risks. Comprehensive First Aid PLUS covers all of the content from Comprehensive First Aid, with some additional extras. You'll learn more advanced skills such as managing the airway of someone with suspected head and spinal injuries. You'll learn how to use a pocket mask and AED, how to splint fractures, how to assess and manage risks, and comply with health and safety regulations in the workplace. 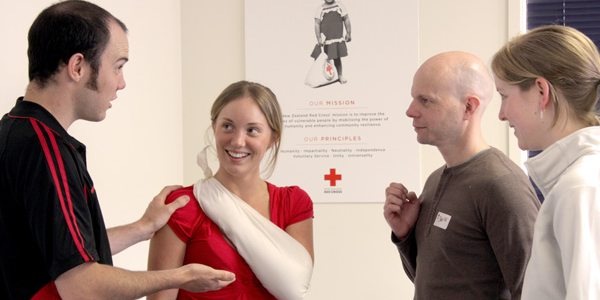 If you have recently completed a Comprehensive First Aid course, you can upgrade to this advanced course by completing an additional four hours of work. The course meets, and exceeds, the NZQA and Worksafe Good Practice Guide. basic techniques for lifting and moving.